A dojo (道場) is a Japanese term which literally means "place of the Tao". Initially, dojo were adjunct to temples. The term can refer to a formal training place for any of the Japanese do arts but typically it is considered the formal gathering place for students of any Japanese martial arts style to conduct training, examinations and other related encounters. The concept of a dojo as a martial arts training place is a Western concept;in Japan, any physical training facility,including professional wrestling schools, may be called dojos depending on the context. 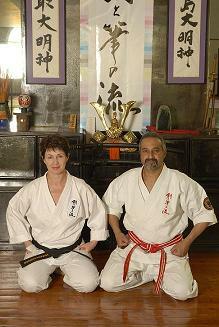 A proper Japanese martial arts dojo is considered special and is well cared for by its users. In many styles it is traditional to conduct a ritual cleaning of the dojo at the end of each training session (called souji, which translates from Japanese as "cleaning"). Besides the obvious hygienic benefits of regular cleaning it also serves to reinforce the fact that dojo are supposed to be supported and managed by the student body, not the school's instructional staff. Many other artifacts may be displayed throughout the dojo, such as kanban that authorize the school in a style or strategy, and items such as tatami(mats)(畳), makiwara -(巻藁) (striking board), punching bags, striking pads, Taiko -(太鼓) (Drum) or armor (yoroi). It is not uncommon to find the name of the dojo and the Dojo Kun (roughly "dojo rules") displayed prominently at shomen as well. Visitors also typically have a special place reserved, depending on their rank and station. Weapons and other training gear will normally be found on the back wall. The kabuto-Samurai Warriors Helmet of Date Masamune, along with the German Stahlhelm, were the inspiration for the helmet of Darth Vader. Vader’s helmet, armour and robe is highly reminiscent of samurai armour. 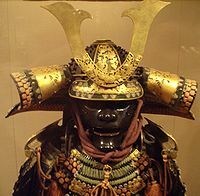 The helmet is taken directly from the menpō mask and kabuto helmet of a feudal samurai. Vader also wore an under-robe of black that resembled long, flared out pants, called hakama, a garment worn in feudal Japan. The Kabuto was also the inspiration for the Pokémon Kabuto, and Kabutops. Daruma dolls (達磨 ), also known as dharma dolls, are hollow and round Japanese wish dolls with no arms or legs, modeled after Bodhidharma, the founder and first patriarch of Zen. Typical colors are red (most common), yellow, green, and white. The doll has a face with a mustache and beard, but its eyes only contain the color white. Using black ink, one fills in a single circular eye while thinking of a wish. Should the wish later come true, the second eye is filled in. It is traditional to fill in the left eye first; the right eye is left blank until the wish is fulfilled. 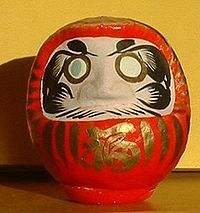 Many of the Daruma dolls are male but there is a female daruma doll. It is called hime daruma or "princess daruma." The Daruma dolls return to the upright position after being tilted to one side. As such, the daruma has become symbolic for optimism, persistence, and strong determination.